I had just finished my workout at the J. Fred Corriher YMCA and was stretching on the mat that covered most of the floor in the Functional Training Center. I glanced down at the corner of the mat, and I couldn’t believe what I saw! All of us have times when we feel weary and weak, whether it’s physically, emotionally, spiritually, or a combination of the three. In those times, it’s comforting to know the Lord meets us there and personally provides what we need. Through an encounter with His people. This past Sunday, I had a heavy burden about something. I felt worn out and sad. A good friend of mine just happened to slip into the balcony and sit right beside me in the church pew. A gifted soloist later sang a song about trusting God, and the tears started flowing down my cheeks. My friend put her arms around me and just let me cry. It was as if the Lord, Himself, was holding me. I believe that’s one of the reasons Hebrews 10:25 tells us to never stop meeting with other believers and to always encourage one another—because we can experience the love of Jesus in one another. “We love, because He first loved us” (1 John 4:19, NASB). I attend a weekly ladies Bible study group, and we share about the things that make us feel weary and weak. Last week, I shared about my current burden, and those ladies loved and encouraged me and gave me strength to keep going. Through an encounter with His Word. 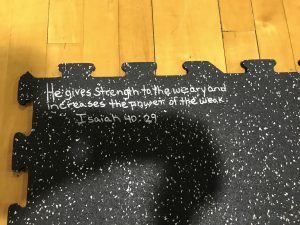 That scripture on the gym floor spoke volumes to me. God’s Word is alive (Hebrews 4:12), and the Holy Spirit ministers it to our weary hearts and strengthens them (John 6:63). We are told His Word “sustains the weary,” and the Lord desires to instruct us in it every day (Isaiah 50:4, NASB). The Word of God revives us and strengthens us (Psalm 119:25, 28), and it is often in these weary and weak places that we discover new treasures from the scriptures than bless us for the rest of our lives (Psalm 119:71-72). I have been meditating on Isaiah 40:29 lately, and it is going deep into my heart. I know the Holy Spirit will bring it up again whenever I need it for the rest of my life (John 14:26). Through an encounter with His Son. Jesus said, “Come to Me, all who are weary and heavy-laden, and I will give you rest. Take My yoke upon you and learn from Me, for I am gentle and humble in heart, and you will find rest for your souls” (Matthew 11:28-29, NASB). He was talking about receiving what He did for us (solving our sin problem), and giving our lives over to Him, letting Him lead and take care of us. Personally, I find I get most tired when I slip into thinking I need to do everything in my own strength. Yet, Philippians 4:13, NASB, says, “I can do all things through Him who strengthens me.” The “Him” is Jesus. He gives us the strength and power to go through our daily lives—no matter what might come—and make an impact for His kingdom. Jesus shows up. In His people, in His Word, and in His presence, which lives inside us in the form of the Holy Spirit (John 7:39; Acts 1:8). It’s through Jesus’ presence in us that He “is able to do far more abundantly beyond all that we ask or think” (Ephesians 3:20, NASB). That’s because in the end, it’s all about His capabilities and not ours. We discover in our weariness and weakness that “the surpassing greatness of the power will be of God and not from ourselves” (2 Corinthians 4:7, NASB). He tells us, “‘I will refresh the weary and satisfy the faint’” (Jeremiah 31:25, NIV). Hopefully, others will see Him working in the midst of our weariness and weakness and be drawn to Him too. 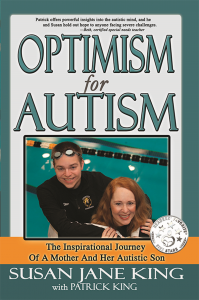 We can all look for Him and know He will be there when we find ourselves down on the mat. Question: Are you feeling weary and weak today? Comment at the link below, and tell us how we can pray for you.